Can this possibly look like fun to anyone but me (and Caroline, of course)? The bike is loaded with five days worth of gear – tent, sleeping bags, cycling clothes, civilian clothes, pots/pans, cooking gear (Caroline bringing the campstove), food for Monday dinner, Tuesday breakfast, wine, snacks, homemade shortbread cookies (thanks to my inner Martha Stewart ), a book (of course), headlamp, and various other necessities. 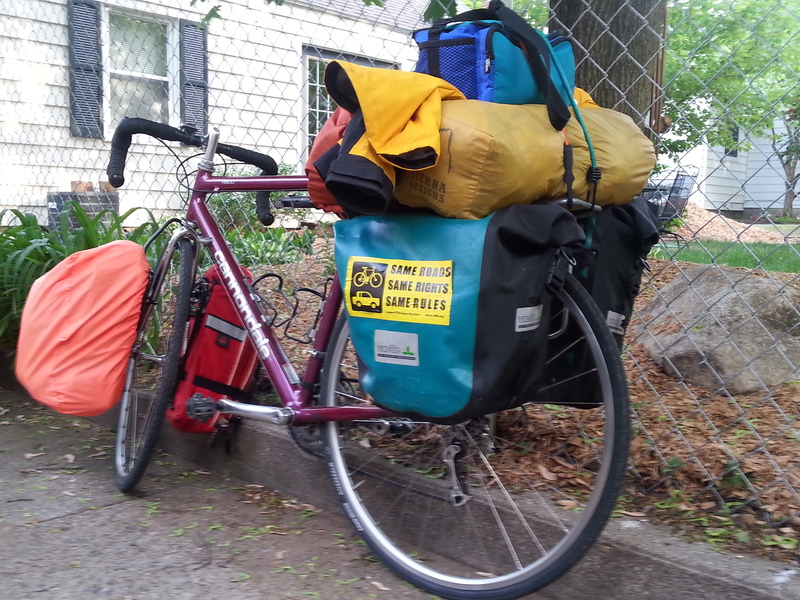 Five days/four nights: about 300 miles. I LOVE cycle-touring. Loaded all my gear and did a 30-mile shake-down ride Sunday afternoon. Perfect. The bad thing? 80% chance of thunderstorms Monday. Just hope it’s not raining when we set off – that’s NEVER fun. This entry was posted in camping, cycling, Michigan, retirement, simple camping, state parks, weather and tagged camping, cycling, Michigan, retirement, road trip, simple camping, state parks, the great outdoors, weather by Judy Crankshaw. Bookmark the permalink. It’s a blast – you should give it a try, sometime! You go, girl. . .hope you have fun!! We DID have fun. More to follow…. I’m not sure it looks like fun on a bike, but I hope you have a wonderful time! What a fantastic adventure! Sounds like extreme fun! It’s never without a few ‘interesting’ moments. Always an adventure. I wish I was as adventurous as you two. Hope you have a blast and that the rain skips wherever you are when it comes down. You are as adventurous, and probably smarter, too! Skip thru the rain? Nah…. It sounds like fun, but I think that I’d rather do it by Subaru! Good luck on your trip! Jerry, there were a few days when I wished for the Subaru, too. You are my heroine—–I was looking for the hitch for the Fireball but don’t see it. LOL Have fun and dodge the raindrops. Seems like I had enough weight on the bike that it could have been the Fireball. Almost looks like Nancy and I in 87, everything but. Love it, wish I could do it today. It is fun, isn’t it? Not sure if I would be up to going cross-country like you did, though. You are so adventurous Judy! Go out there and do it so we can live through you vicariously! Sunny skies and smooth sailing! We didn’t exactly have sunny skies and smooth sailing – rain and rough roads, instead. But, a blast!